This is Adele (Adkins) at yesterday's Grammy Awards. Last night she received six of them, including Best Pop Solo Performance for "Someone Like You" and Song of the Year for "Rolling in the Deep". Of course she already had two from 2009. Wow! 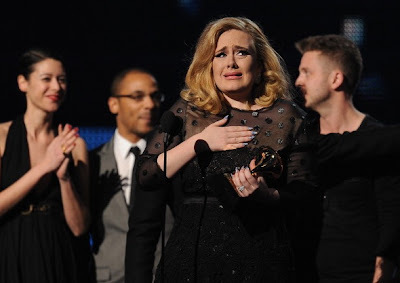 In this image, Adele has her hand over her sternum and her left upper chest. This of course overlies the heart. Notice that her entire hand, palm included, is touching. This "palmar touch" is consistent with a high "Sincerity Quotient". Often people display this when the hear stories or witness events which provoke strong empathy. If you see someone touching with just their fingers, be careful, for they are likely feigning empathy (see: Secret # 665: A Strong Sign of Insincerity). Red flag time.